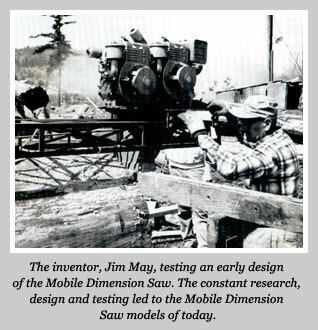 Written by Lara May, the inventor Jim May's wife. Sometime in 1962 as Jim and I were returning home from a camping trip, we stopped to watch and talk to some loggers. We learned that the loggers were required to haul out big, partly rotten logs (cull logs) at their own expense and was not getting paid for them at the mill. Bear in mind, this was a depressed economic time of our history, so even at the best; it was not a job to get rich at. Due to that encounter, the idea of a portable sawmill was born. One light and portable enough to be taken into the woods and manufacture lumber on the site, leaving the rotten parts of the log. A truck capable of hauling 4,000 board foot of logs (scaled down and perhaps only partly saleable) was able to haul 11,000 board foot of lumber, making a profitable payload, the hauled lumber pieces all had a value. Through the ensuing years, many false starts were begun, many models and experiments, chain saw bars, circular saw blades, Onan engines, Briggs and Stratton engines, and even 2 engines at a time and finally ending up with what it basically is at this time. A VW engine and 3 circular saw blades. We erred in judgement, were discouraged and disgusted and made enough unproductive decisions about ways to get it manufactured and put it on the market. We licensed a company to make it, but it was a very discouraging two years. Finally in January of 1966 we decided to act on that old axiom, "if you want a thing well done, do it yourself". Acting upon that decision, we rented an old building, bought, begged and borrowed machinery and started manufacturing the sawmill. Needless to say, we worked many long hours and squeezed each dime until we could make people aware of the potential capabilities of the sawmill. Since the start, the sawmill has been used around the world and has proven to be one of the best inventions.